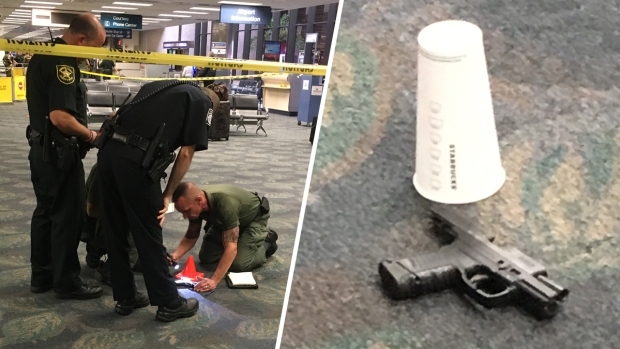 As the nation comes to grips with the deadly shooting at the Fort Lauderdale-Hollywood International Airport Friday afternoon, some people are looking into the rules behind carrying a firearm onto an airplane. The truth is passengers are allowed to travel with unloaded firearms and ammunition as long as they pack the belongings in locked, hard-sided containers and check the baggage so that it sits in an airplane's unreachable luggage compartment during a flight. A gunman opened fire in the baggage claim area of Terminal 2 at Fort Lauderdale-Hollywood International Airport Friday afternoon, killing at least five people and wounding eight others. Ian Cull reports. The illegal act is to bring a firearm directly onboard in a carry-on bag. But people break that law more than some may think. The Transportation Security Administration reported that thousands of guns are found in bags at airport security checkpoints every year. A total of 3,306 guns — some of them loaded — were seized in 2016 alone compared to 2,653 in 2015 and 2,212 in 2014. NBC Bay Area aviation analyst Mike McCarron addresses the deadly shooting at the Fort Lauderdale-Hollywood International Airport and what potential travel changes could come about following the tragedy. Security experts say removing guns from checkpoints and securing public areas remains a chief priority. Passenger John Payne from Florida is wishing for even more protection. He said that armed security personnel are needed to prevent another Fort Lauderdale tragedy from costing more innocent lives. "Someone who is having a mental episode is possibly going to think twice if someone is armed next to him who is going to stop what he's trying to do," Payne said.